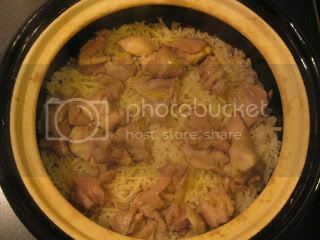 Today's menu is Chicken Ginger Rice, or we call it "Tori Shoga Gohan" (鶏生姜ご飯) in Japanese. Ginger is a magic ingredient, indeed. 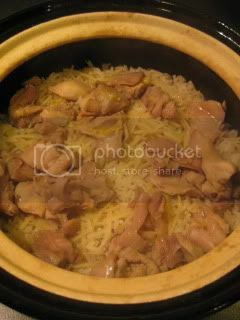 The generous amount of ginger in this dish makes this rice so aromatic and gives nice accent to the flavor of the chicken, too. 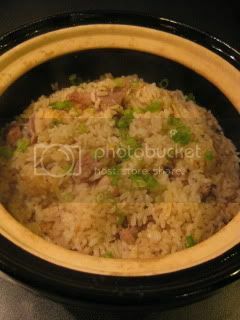 For this dish, I use 3 rice-cup size double-lid donabe rice cooker, "Kamado-san". 1. 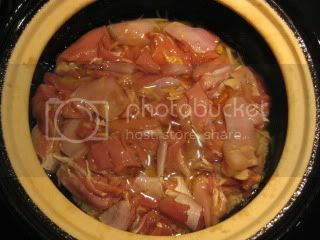 In a bowl, combine the chicken, sake, soy sauce, and fish sauce. mix well by hand. Cover tightly with a plastic and let the chicken marinade in the refrigerator for 30 minutes. 2. 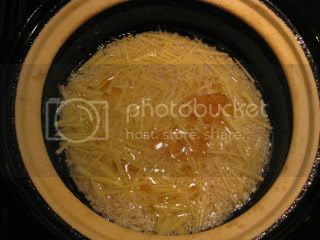 Meanwhile, in Kamado-san, combine the rice, dash stock, and sesame oil. Let the rice soak for 20-30 minutes. 3. Add the ginger to Kamado-san and spread over the rice. Add the chicken with the marinade liquid and spread on the top. 4. 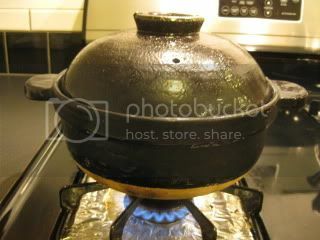 Cover with both lids and cook for about 15 minutes. If you want the nice crust ("okoge") on the bottom cook for extra 1-2 minutes. 5. Turn off the heat and let Kamado-san rest (with both lids on) for 20-30 minutes. 6. Uncover and fluff the rice. Garnish with some scallion and sesame seeds.